Today, we are having a great gift for Allama iqbal opn university Intermediate (F.A) Students. 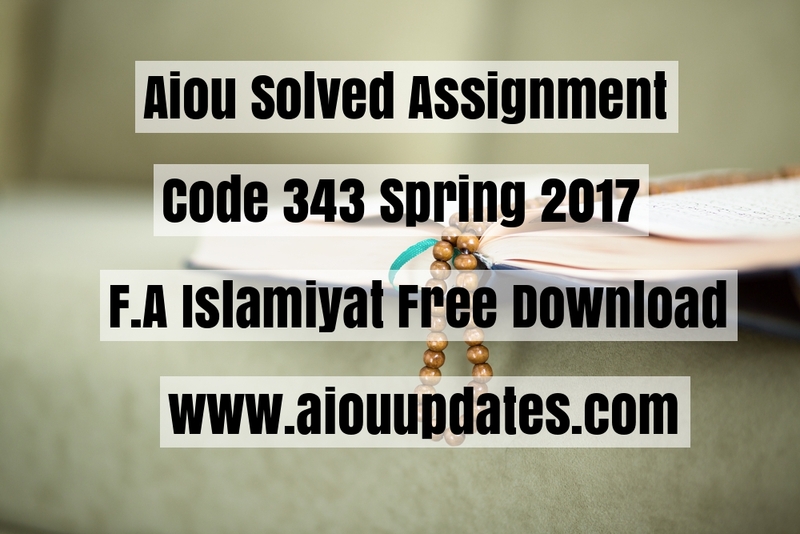 Do you want to know what is it, then read this post till the end.As the title of this post show's that we are going to give you, aiou solved assignment code 343 (islamiyat) for spring 2017 session.In Our last post for the assignment of bachelor of arts.Many of the ntermedite students comment's that to " Upload F.A Assignments Asap"
So here we are with our first solved assignment for Intermedite level students of session spring 2017.
some help from online websites. We have maden this assignment code 343 from you'r book that was issued by aiou to you.Click below button to download for free aiou solved assignments code 343. So feel Free To Download this helpful meterial to complete you'r assignments. Hereby Many on students ask's us to tell them about aiou assignments submission last date spring 2017. You can check it by clicking on it.Feel Free to tell us you'r oponins about 343 aiou solved assignment by Us in comment section.